Fetzer, a former Marine Corps officer and McKnight Professor Emeritus at the University of Minnesota Duluth who’s published extensively on a variety of topics, including cognitive science, evolution, mentality and scientific knowledge, believes the Sandy Hook Elementary school shooting was an “elaborate psy-op to promote gun control” and that no children were in fact killed that day. Supported by documentation, Fetzer argues that Sandy Hook Elementary, located in Newtown, Connecticut, was not even an operational school at the time of the shooting and hadn’t been since its closure in 2008 due to its “deplorable physical condition (both inside and out)” and its noncompliance with federal and state laws. In 2002, engineering consultants recommended the school district allot $4.5 million to “upgrade and renovate its heating and ventilation system” over a nine-month period beginning in 2010. Two years later, the Newtown Board of Education was told the school, built in 1956, had a severely dilapidated roof, and in 2008, learned the facility was contaminated with asbestos, lead and PCBs under its foundation. Ten months after the shooting, the city approved a referendum to demolish and rebuild a brand new K-4 elementary school using a $50 million state grant. If the city already knew in 2008 that the school was contaminated with asbestos and, in 2013, used the contamination to justify tearing it down, why would the same asbestos-contaminated school be safe for children and teachers to inhabit from 2008 through 2012? If SHES had remained open, wouldn’t the school district be sued for endangering public health? Connecticut Gov. Dan Malloy said during a press conference on the day of the shooting that he had been told something like this might happen. After doing some digging, Fetzer learned that about three weeks before the alleged shooting, Attorney General Eric Holder met with Gov. Malloy to discuss “Operation Longevity,” a comprehensive initiative to reduce gun violence in the state’s major cities. Coincidental timing? Perhaps. Nobody Died at Sandy Hook presents 50 photos showing “the preparation of the Lanza home as a prop and another 50 documenting the refurbishing of the school as a stage.” The book describes the scene of the shooting as a stage fully equipped with Port-a-Potties, a sign reading “Everyone must check in,” boxes of bottled water, pizza cartons and parents bringing their children to what was portrayed as a school shooting. Fetzer points out that there were reportedly 489 students present at the school that day, minus 20 who were killed; however, there’s no evidence of staff evacuating the 469 remaining students. The “iconic” picture (featured to the right) is the only documentation illustrating what would’ve been a fairly massive evacuation. 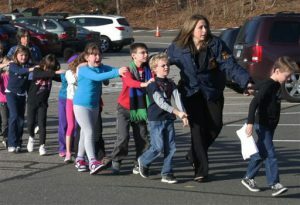 More oddities surrounding the Sandy Hook Elementary school shooting include parents expressing no grief, donation websites created prior to the massacre, lack of emergency medical helicopters, ambulances forced to set up shop at the fire station located several hundred feet away and the government’s refusal to release the victims’ death certificates and burial sites. Supporting the theory that the school had been closed since 2008, photographs illustrate hallways and classrooms stored with junk (furniture and office supplies), lack of handicap parking spaces and the absence of Internet activity from 2008-2012. Using the Internet Archive’s Wayback Machine, Fetzer and his colleagues discovered the facility had NO Internet activity since 2008 when it was found to be contaminated with asbestos. According to Dr. Carver and State Police, Lanza shot each victim between 3 and 11 times during a 5 to 7 minute span. If one is to average this out to 7 bullets per individual—excluding misses—Lanza shot 182 times, or once every two seconds. Yet, according to the official story, Lanza was the sole assassin and armed with only one weapon. Thus, if misses and changing the gun’s 30-shot magazine at least 6 times are added to the equation, Lanza must have been averaging about one shot per second—extremely skilled use of a single firearm for a young man with absolutely no military training and who was on the verge of being institutionalized. So, somewhere between five and seven minutes, Lanza was able to kill 26 people including himself – a 96 percent kill ratio – “which is unheard-of-accuracy even among experienced marksmen.” Professional military investigator and ballistics expert Mike Powers says the entire scenario is physically impossible, adding that Lanza’s slight build (112 lbs) would make it extremely difficult, if not impossible, to carry the “heavy, bulky weapons and ammunition” he was reported to have used. For more information on the inconsistencies surrounding the Sandy Hook shooting, check out Fetzer’s book, which is available in full here[PDF]. Go to moonrockbooks.com as your conspiracy research catalogue and book archive. Sandy Hoax proves beyond all doubt that our own government is the enemy of every American. Any government that would do something like this is beyond redeemable they are pure evil. One other thing, for a public school there are no Christmas decorations….and this was two weeks before Christmas. Plus this: The cars in the parking lot were license checked. Most were listed as being in a police impound lot in another town. So tell me, how can these cars be in impound and also in the school parking lot at the same time? Oh btw, the videos talking about this have been scrubbed from YouTube, as have hundreds of other videos that reveal the SH truths. Don’t you mean “propaganda” masquerading as “research”? Egad! The school was not even in compliance with state and federal laws for Americans with Disabilities and therefore could not have been legally open. You must have missed the memo! Go back and watch the first five minutes of “Sandy Hook Update: Tracy loses, Wolfgang wins. The Deep States Strikes Back!” (on Bitchute). You cannot cope with even the most obvious and blatant proof that the school was closed and there were no students there. Which means your posts are telling us more about you and your presence here than they do about Sandy Hook! Debunk that photo, without saying it’s photoshopped or overlay or some other editing excuse. February 26, 2019 at 7:41 pm ..What’s to debunk? What does it prove? And, Bob…to be honest, that image does look doctored….there seems to be a separation between the school and the playground…very visible. AND, that triangular “paved” area to the lower left leading up to the playground does not look natural at all. I do not have the technical know-how to analyze that, but someone may. There’s been some very horrible nations on this planet in the past 5K years of recorded history. But I’m hard pressed to find another country as evil as the United States. I say this in reference to the fake killing of 20 kids and 6 adults to make a political point. Plus, to facilitate and enforce this, the US government enlists the news media to endorse the lie and repeat it thousands and thousands of times. Six years later the new media is still reporting the fake massacre as sacred truth. Benjamin Franklin, a signatory of the Constitution, demanded that the news media was to protect the ”people” and to provide them with honesty and truths. In the US, the media does the exact opposite. The MSM is a viper’s den of lies… 24/7. The USA has sadly morphed into a Hell of unimaginable depravity and sordid wickedness. Its bad enough for adults to partake in inequity but God-forbid, the US government used children to promote an unconstitutional agenda. Did the Sandy Hook children give their mature and informed approval to participate in that morally sick event? These children went on to star in other “School shootings” for gun control. https://davidduke.com/the-20-schoolkids-at-sandy-hook-murdered-by-hollywood-not-guns/ Some were connected to the Hollywood pizzagate stories, and their services were sold to Hollywood by their parents. People that were shown in graveyards were at fake burial sites. https://davidduke.com/the-20-schoolkids-at-sandy-hook-murdered-by-hollywood-not-guns/ Infowars got too close to the truth, and the democrats outlawed Mr Jones stories on it. Why did a school bus driver allegedly drop off some of the kids from SH school at Gene Rosen’s house? Rosen’s driveway is only about 50 feet from the Fire Station yard which was jam packed with police cars, ambulances, fire trucks and many people. Why stop at Rosen’s house…where Gene treated the kids to cookies and juice? Why didn’t the bus driver take them to their respective homes where they would be safe? Why would the bus driver take the kids about one quarter mile from the school and abandon them at a stranger’s driveway? Why wouldn’t Gene take the kids to the Fire Station. His inviting them into his home is alarming. On another note. Two years after the SH event the perfectly good Lanza home on Yogananda St. was demolished. Why? Just because someone allegedly died there does not automatically mean that its not liveable. These children went on to star in other “School shootings” for gun control, their scams paid for by democrats. https://davidduke.com/the-20-schoolkids-at-sandy-hook-murdered-by-hollywood-not-guns/ Some were connected to the Hollywood pizzagate stories, and their services were sold to Hollywood by their parents. People that were shown in graveyards were at fake burial sites. https://davidduke.com/the-20-schoolkids-at-sandy-hook-murdered-by-hollywood-not-guns/ Infowars got too close to the truth, and the democrats outlawed Mr Jones stories on it.